A few years ago, we spent Christmas here in Chiapas. Just a few days before THE DAY I was wrapping a few gifts for Cloe and Nathan. At the time, the local orphanage had just a couple orphans and the family running it had 3 kids who were taking music lessons from my sister in law. Between lessons they would come up to my house and talk… while I listened… because I spoke almost no Spanish at the time! As one of the girls sat watching me wrap gifts, her eyes kept getting bigger. Finally she asked “are all 3 of those gifts for Cloe?” and I answered yes. She was amazed. I asked if they do gifts for Christmas, and she said sometimes they each get their own bag of candy. Um. That’s it? For the next several days I kept thinking “wow… no gifts for these kids at all. Children who have been abandoned by their parents and could really use a tangible show of love.” Just try to imagine the feeling of worthlessness that these kids must have, knowing that many of them *had* parents, but they just simply weren’t wanted. That was a really hard, lonely Christmas for me… my first one ever to be away from my family. We celebrated mostly alone with our little Cloe, while my family was back in CO… all 30 of them… playing games and eating yummy food! Had I not thought to take a pregnancy test that morning and discovered that Gabi was on her way, it would have been a really REALLY hard day! Because of that fact, we spent the next several Christmases in Colorado. All the while, the orphanage has been on my heart. This year, we’re planning on being here in Chiapas for Christmas again! Once I started thinking about that a few weeks ago (we’ve known for a while, but I’ve been avoiding the topic in my mind), I started to panic a little. Then I heard God whisper “now you can do something for the orphans for Christmas!” and the excitement began. What if we show people the needs that are currently there, and allow those who are interested to sponsor different things? One of my main desires is for these kids to know that they *are* loved, they *are* worth something, and that there are Christians out there who are praying specifically for them. My dream is to present them with not only gifts, but pictures. If your family wants to contribute $10 for an educational toy, I want to give them that toy with your family’s picture attached to it so they can see where it came from and know that this family prayed (hopefully is still praying) for them! On the other side of that coin, my dream is to send you a picture of the kids with the gift that you gave them. I am hoping that doing this will help you (your kids, your church family, etc) feel a part of their lives. 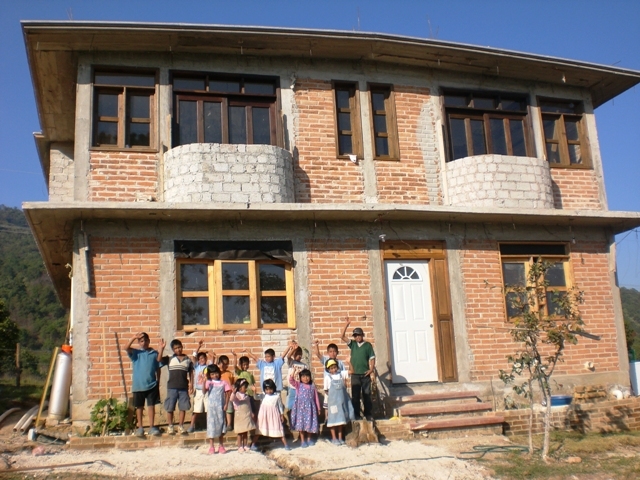 Right now, the orphanage has 18 kids living in it. The family that runs it is juggling a huge load! They are trying to home-school all of these kids, and are doing an amazing job with training and loving them. Half of the boys want to be pastors when they grow up! You would be floored if you could spend some time with them. You’d also probably be saddened to see their living conditions, playground, toy box and school supplies! There are plenty of needs to be filled there. This is not a drive for used toys or clothing. Due to transportation and importation issues, we will likely need to buy most supplies here in Mexico. If you, by yourself, want to contribute towards meeting a need for the kids… awesome! If you want to get your church, Sunday School class, home-school group, office friends, play group, etc involved… great!!! That would allow us to do some bigger things for the kids, such as getting some home-school supplies or finishing their swing set. Whatever group you end up with, please be sure to send (either postal or e-mail) a picture as well! This will mean more to the kids than you can know. A single toy (educational or just for fun) – This would be a good option if you want an item to be just from you/your family. We’d get something fun and educational like this toy from LeapFrog. Or if you have another specific gift in mind, just tell us! Toy fund – If you don’t mind sharing the “from” space on the gift, this is a good option if you have a small donation. Just a few small donations would enable us to get a larger toy gift like this one. School fund – The amount that this fund receives will determine where it goes. It could be as simple as a mobile of our galaxy, as big as a MiniLuk system, or as practical as notebooks and pencils. General blessing fund – Whatever lands in this category will go towards something big, most likely. We’ll be asking Carlos and Yara (the parents who run the orphanage) what would bless them most. At this point we’re guessing a jungle gym type thing. Possibly a musical instrument or two, as many of the kids are interested in music. In the memo line, please specify which category you are giving for (single toy, toy fund, desks, school or general). Don’t forget to include a picture of yourself for the kids to keep, as well as an address (e-mail or postal) for me to send you a picture of the kids with your gift! Or you can use our paypal account (nathan_terrell@sil.org) to donate. If you use that method, just e-mail me with your preferred category and picture. Lastly, you could deposit directly into our Bank of America account. Just contact me for the details if that’s the method you prefer! If you want to donate to a particular need, we have a deadline of October 15th. After that, any donations received will go to the General Blessing fund, to fill whichever need is greatest for them at that point. PLEASE feel free to pass this along! E-mail it, repost it, tell your church about it! I believe it would be impossible for us to over-bless these sweet kids. 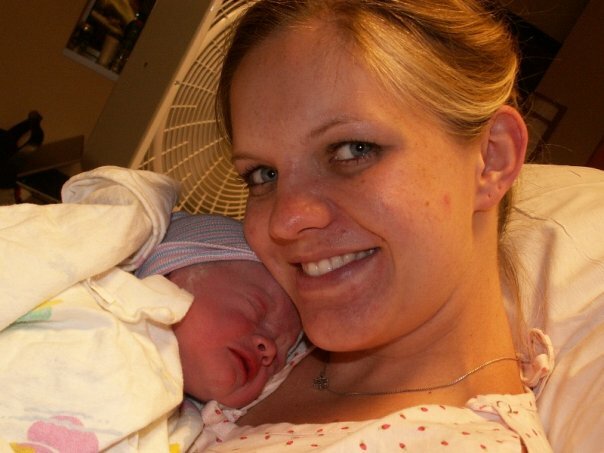 It is hard for me to believe that it’s been 3 whole years since Gabi Joy burst into our world! 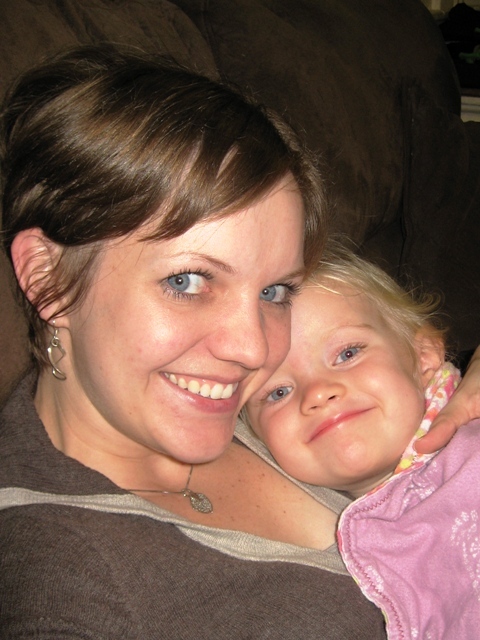 In some ways, it feels as though she’s always been part of my life, and I can barely remember what our home was like before she came into it. In other ways, It feels like just yesterday that I told my beloved Dr. Vargas “I am so miserable… just induce me already!! !” Thankfully, even though she did induce me, everything went perfectly fine. After 5 hours (I thought they were intense, until I survived Brennah’s birth!) I was holding my precious Gabriella in my arms. I hope you’ll indulge me a few minutes… I’m feeling nostalgic tonight! Three years ago today... walking out the door for the hospital! 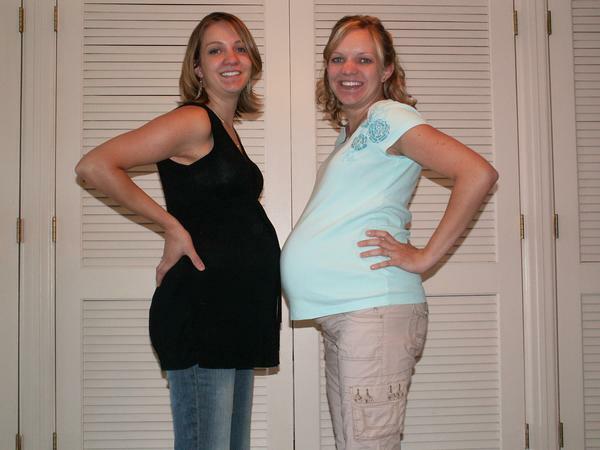 Kimberly was just a month behind me, due with Landon. Not the most flattering picture, but I love it. Gabi was 5 minutes old, and that fan behind us totally saved my life just a few minutes earlier! How precious is she??? 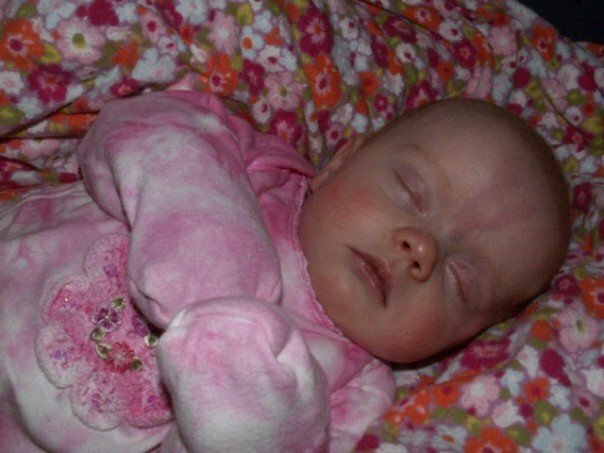 I loved watching her sleep. 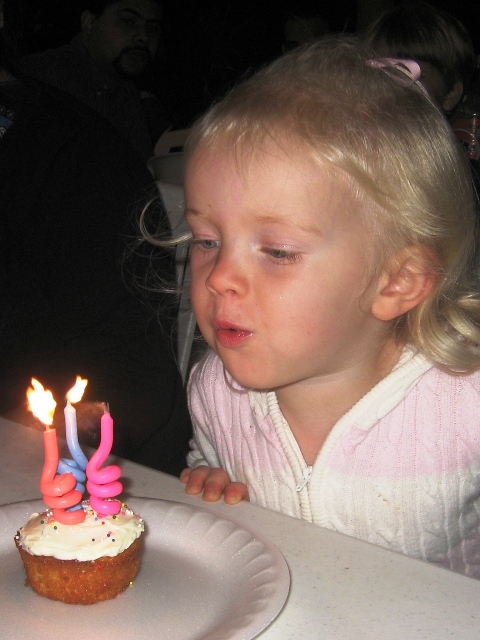 Tonight... blowing out THREE candles on her cupcake! Just before Gabi blew out the candles she looked at me and said “thanks Mom for these cupcakes.” 🙂 She melts my heart!!! I am so thankful that God has entrusted this sweet little girl into our care. If I tried to explain how crazy things have been here lately, it’s doubtful that you would believe me! I’ve debated several times just picking up my computer and calendars and going somewhere absolutely quiet so I can get caught up. But there are always several things around here that are screaming my name at any given moment, so I’m having a hard time doing that. Today, I’ve detemined to ignore everything that is screaming my name (laundry, cleaning, organizing, etc… NOT children) and focus on all the computer things that need to be done. So this is just to say “I’m workin on it!” Here’s what my view will be all day. 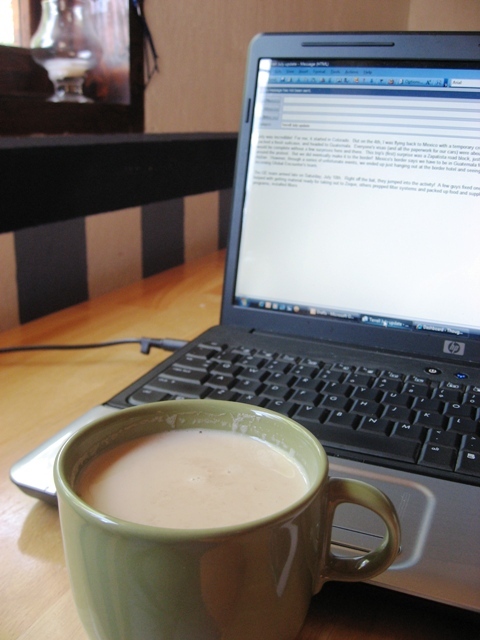 Long as the chai stays filled, I’m good. Thank you, in advance! I’m sure my chances are slim, but hey. It doesn’t hurt to try right? If you felt so inclined, you could even pass this along! Just follow this link, and click “vote for this entry”!